Kidliterati: Secrets of Kidlit: Author Spotlight on Alison Cherry! Secrets of Kidlit: Author Spotlight on Alison Cherry! Today we have the opportunity to hear a little bit about her process as well as the similarities and differences between writing for the Middle Grade versus Young Adult audiences. Ms. Cherry, The Classy Crooks Club is your middle grade debut. Your previous novels, Red and For Real, are for an older, young adult audience. What drew you to tell AJ's story? And was the transition from writing Young Adult to Middle Grade difficult or more fun? I love writing young adult—exploring the angst and awkwardness of navigating new responsibilities and relationships and romances is extremely appealing to me. But I remember just as clearly what it’s like to be twelve and watch your universe get so much more complicated in ways you don’t expect, and I wanted to take a crack at that, too. (It’s also a relief to take a break from writing romantic subplots sometimes!) The middle grade voice didn’t come to me right away—this is my second attempt, and the first book didn’t work nearly as well. But once I got it, AJ’s voice felt really natural to me, as did Izzy’s (the narrator of my next MG book!) I love walking the line between saying something deep and true and being completely ridiculous, and middle grade feels like exactly the right place for that! What does a typical writing day look like for you? Is there music that you listen to, a favorite window to sit in front of, a favorite café or park that draws your attention? My favorite thing about being a full-time writer is that there doesn’t need to be any such thing as a typical day. If I feel like working in the morning, I can! If I feel like going to a movie at noon and then working into the evening, that’s just as acceptable! That being said, my brain works best during the hours of 11 AM and 5 PM, so I’m pretty much always working then. I’m not super picky about where I work, as long as there are outlets and food available, but I do have a favorite café in my neighborhood. They have amazing waffles and delicious iced tea, and the baristas all know my name. The only place I absolutely can’t get anything done is on an airplane. How is your writing process different between the middle grade and young adult categories? It’s not different at all! I outline, draft, and revise in exactly the same way, regardless of what age group I’m writing for. My middle grade and young adult novels aren’t even significantly different in length. I’m sure I’ll use the same process to write for adults, too, if I ever choose to do that. In your second novel, For Real, you had to create several reality shows for the plot - from scratch! Which meant you researched a TON of reality shows to prepare. 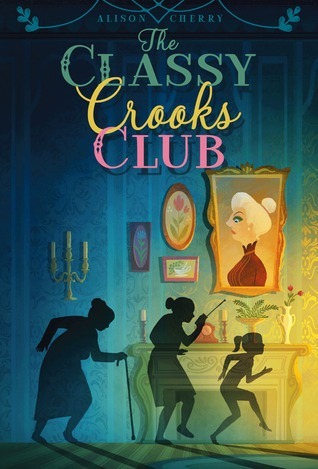 Now in The Classy Crooks Club, your character AJ discovers that her grandmother's bridge club is actually a band of thieves. Be honest - did you infiltrate a secret society of nursing home ne'er-do-wells? What was the most fun or interesting thing you discovered while developing this story? I didn’t have to do nearly as much research for this book as I did for Red and For Real, but I did have to learn a lot about lock-picking and parrot behavior. The best thing I found while researching was a YouTube video of a parrot singing a piece of the Queen of the Night aria from The Magic Flute. I also had no idea parrots could imitate sounds like creaking doors and car alarms. The exotic bird expert I talked to told me there was a cockatiel at the zoo she worked at who could replicate the sound of the office phone so precisely that people ran inside to answer it all day long, only to find no one on the other end. The majority of middle grade books focus on the relationship between kids and their friends; sometimes parents, but it's rare to see a grandparent be part of the action. This makes The Classy Crooks Club unique and refreshing! So many kids have a strong relationship with their grandparents; was that in mind as you wrote this? I definitely didn’t write the story because of that—I didn’t have a strong relationship with my grandparents, and it wasn’t something I was itching to express. But I think a lot of the humor in my books comes from putting my characters in unexpected situations, and nothing is more unexpected than a prim-and-proper granny running a heist ring. I loved watching her and AJ come at things from such different places and struggle to find common ground. What are some things you hope readers take away from this story? To me, this is a story about how every person is infinitely more complicated than she appears to be on the surface. It’s about how making assumptions about people’s desires and motivations can land you in some seriously sticky situations. It’s about how ethics can be hazy and unclear, and it’s up to each person to decide what feels moral and right to her. And of course, I want people to come away from this story laughing. Your next novel, Look Both Ways, is due out June 14th and is a young adult novel centering around the relationship between two girls, Brooklyn and Zoe. Is diversity something readers can expect from you as an author in both your Young Adult and Middle Grade novels? I don’t write anything for the specific purpose of including diverse characters, but I live in New York City, so I’m reminded on a daily basis of what a diverse place the world is. I’d certainly like my books to reflect that! You're currently drafting your next middle grade book Willow VS Wolverines about a prank war at a sleepaway camp. Has writing for this age group always been the plan or was it a happy accident? I certainly wouldn’t say it’s an accident—I’ve always loved reading both YA and middle grade, and I’m happy to write in whatever voice suits my story best. I’m thrilled that I’ve been able to switch back and forth between the two categories, since it prevents my brain from getting stuck in a rut. I’m allowed to be much goofier in my middle grade than I am in my YA, and I love being able to explore than over-the-top craziness. It makes writing feel much less like work! *It's well-documented that you love cookies, what's your favorite? Anything chewy with ginger and molasses and cinnamon, but I’ll never turn down a good chocolate chip cookie, either. My favorite Girl Scout cookies are Samoas. *What are you currently reading or watching? I’m working my way through my heaping box of ARCs from the ALA conference! So far my favorites have been Up to This Point by Jennifer Longo and Run by Kody Keplinger. *You're trapped on a deserted island, what five books are with you? 3) Harry Potter and the Prisoner of Azkaban, J. K. Rowling. 5) An enormous anthology of the best American short stories from the last century. I would definitely need some new reading material, and if I didn’t like one story, I could just move along to the next. Thank you so much Alison for allowing us to get a glimpse into your world. It was an absolute pleasure. To keep track of what Alison is coming up with next you can stay up to date on her website or follow her on Twitter!